Discovery Elementary is a neighborhood school where students engage in sustainability practices and serve as stewards of the environment. 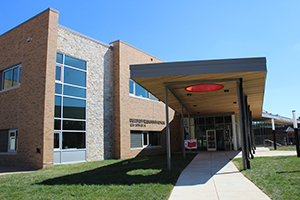 Discovery is a Net Zero Energy school in that the total amount of energy used in a year is approximately equal to the amount of renewable energy created during that year. As a green building, Discovery supports experiential learning and encourages students to be stewards of the environment through service and leadership. John Glenn lived in the neighborhood and ran orbital patterns with his children on the school site. The name Discovery is not only a nod to Glenn, but evokes the spirit of learning. As a Professional Learning Community, Discovery teachers collaborate to plan and deliver engaging and interactive lessons and assess student learning via standard-based grading. Further, teachers implement the Responsive Classroom approach to support students’ academic, social, and emotional development. Discovery Vision: We learn together as a team and encourage everyone to explore, dream, and discover while making a positive impact in our community. Discovery Mission: Explorers learn, collaborate, and innovate with the world in mind.